Be the first to share your favorite memory, photo or story of DR. Valerie. This memorial page is dedicated for family, friends and future generations to celebrate the life of their loved one. 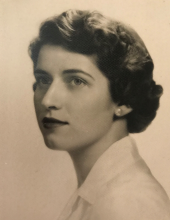 Dr. Valerie Jensen Knotts, 85, passed away peacefully surrounded by her family in The Woodlands, Texas on November 21, 2018. She was born in 1933 in Massachusetts and was the daughter of Nicklaus and Bertha (Emery) Jensen. She was preceded in death by her beloved husband, Franklin Delano Knotts, whom she married on September 11, 1960. She leaves behind her 5 children, Kimberly, Kristen, Katharine, Franklin and wife Bea, and Kerri and husband Darin, as well as 7 grandchildren, Michael, Christopher, Tristan, Trevor, Sarah, Kyle and Jack. Valerie, Ed.D., OTR, FAOTA, was a pioneer in geriatrics at a time when society seemed to be ignoring senior citizens. She originally studied Occupational Therapy (OT) at the University of New Hampshire. As an occupational therapist, she developed curriculum and taught a ground-breaking course in Geriatric Rehabilitation for New York Medical College in the 1950's. In New York City, she served as a Chief OT. She later traveled for the US Public Health Service as Program Director in Korea, where she volunteered in orphanages and conducted a clothing drive from her hometown church. In Korea, she worked with Major Frank Knotts from West Virginia and they fell in love and married. Frank and Val lived in Kentucky, Virginia and Germany. In the late 1960's, after Frank's return from Vietnam, they moved to NH and opened a PR and Management Consulting firm, producing the Manchester Home Show, NH Winter Carnival, NH Talent Show, NH Junior Miss Pageant and political campaigns as well as the annual New England Natural Food and Farming Festivals promoting healthy living and alternative energy. Val did PR for the NH Optometric Association and created a nationally-distributed puppet show on traffic safety for the National Congress of Optometry, did federally funded research on sensory integration for Easter Seals, directed a church choir, led Girl Scout troops, served as a life guard, taught life-saving & swimming, and served as president of the American Association of University Women. In 1976, they moved to Massachusetts (MA) where Frank taught and practiced real estate and Val served as OT and administrator in Public Health Hospitals for 15 years, receiving her master's degree from Boston University. She is credited with founding an award-winning Senior transportation service and an adult day center. The Knotts family also founded the Metro West Performing Arts Center and hosted the annual "Beaux Arts Ball" at their home in support of the Arts. In 1991, Val became Administrator of BU's Sargent Clinic and a faculty member of Sargent College at Boston University. In 1995, they moved to their ranch in west Texas to take a faculty position at Texas Tech University (TTUHSC). Active professionally, Val served as head of research for AOTA's Home & Community Health SIS and on the Geriatric Credentials Committee. Her community service included the United Way, Red Cross, Agricultural Extension Service, Area Agency on Aging, and Texas Silver-Haired Legislature. She's been honored as Leading Women of Boston in 1995, Fellow of AOTA, Presidential Scholar in Geriatrics, Athena Award nominee, inducted into the West Texas Hall of Fame, and received the Award for Excellence in Education from the Heritage Foundation. She is widely recognized for innovative student service projects such as home safety assessments for frail elders. Val chaired an Aging Texas Well Education committee which initiated Link-Ages, bringing together retired teachers and others to tutor and mentor early grade school children. She has written, published and presented papers at local, state, national and international conferences. For her doctoral research, she traveled throughout this country and Europe and competed her doctorate from Texas Tech in 2003. After she retired from Texas Tech University, she continued to teach online for Chatham University. Val worked in the Far East, in Europe and throughout the USA in public and private agencies and is widely recognized for bringing together individuals, groups and resources to develop innovative services. Valerie loved singing and affectionately rocking her children and grandchildren for hours, giving each of her children back rubs and foot massages while peacefully reciting nightly prayers, entertaining family on the piano and with her playful sense of humor, laughing and dancing in the rain, sitting under her big yellow umbrella watching her children and neighborhood friends playing on Duxbury beach, and reading a good book. Valerie's motto was to "Think positively; look for laughter and joy in everyday activities. Cherish and serve your family, your work and your community." A Memorial Service to celebrate her life will be announced later. All who knew Valerie and her family will be welcome to attend. To send flowers or a remembrance gift to the family of DR. Valerie Jensen Knotts, please visit our Tribute Store. "Email Address" would like to share the life celebration of DR. Valerie Jensen Knotts. Click on the "link" to go to share a favorite memory or leave a condolence message for the family.